The Manaslu trekking route might be one of the closest mountain adventures to Kathmandu, but it could hardly be further from the frenetic pace of life in the valley. It’s a kaleidoscope of colours, vegetation, landscapes and climates. The sensational mountain vistas and unworldly landscapes will be etched into the memory forever. Shortly after leaving the Kathmandu Valley rim, there are magnificent views of Ganesh Himal and the Himalchuli/Manaslu range, as well as the more distant Annapurna peaks. For the first few days hikers can luxuriate in the warmth of the low riverside trail along the Budhi (Buri) Gandaki river. The trail meanders, scrambles, soars and dives its way along the confines of the valley. In places the river cuts through very narrow towering cliffs, graced by fairytale waterfalls. Beyond Jagat the colourful Hindu culture is replaced by the more contemplative Buddhism. Mani walls, kani gates and chortens dot the byways. 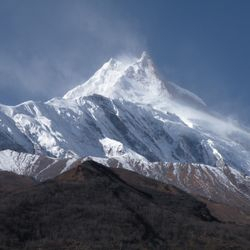 Heading northwest from Philim through Deng, the Manaslu Circuit trail continues its relentless climb to the upper reaches of the Budhi Gandaki, a river now of diminished stature but of tremendous scenic delights. The villages of Lihi, Sho, Lho and Shyala are fascinating – a window into the secluded Buddhism of the wild valleys. Meanwhile, ever more imposing and spectacular vistas of Himalchuli, Ngadi and Manaslu cast magical spells on the trekker. The geographical and geological transition to the arid upland of the Tibetan plateau beyond Samagaon is astonishing. Beyond Samdo is the high, wild pass of the Larkya La, the highest point of the trek at 5160m. The fabulous panorama from the pass encompasses the beautiful massif of Cheo Himal and Larkya Peak, then the giants of the Nar-Phu region – Himlung, Kang Guru, Nemjung and Annapurna II. The Bimthang meadows provide a welcome respite from the high altitude, the winds and the harsh dry air. This is a paradise of elegant peaks, quiet forests and bubbling streams. From here the trail descends rapidly to Dharapani, where the trek meets the popular Annapurna Circuit route and the new dirt road. Alas, all too soon the trek concludes near Tal, or further down at Bhulbhule for those trekkers who take the Bahundanda trail.